Outreach archivist Meghan Courtney traces the evolution of Detroit Adventure, a coalition of cultural organizations founded in 1958 to promote cultural conversations and experiences in metropolitan Detroit. 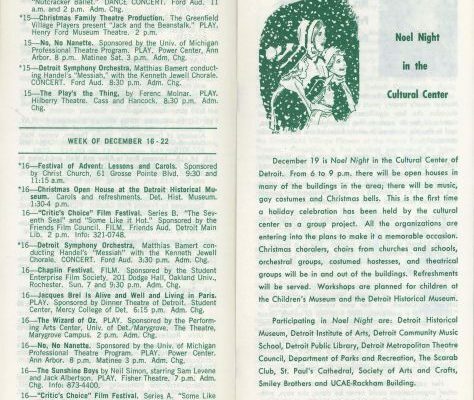 In 1973 the organization debuted Noel Night, a free holiday open house in Detroit’s cultural center. Now run by Midtown Detroit, Inc., Noel Night features: performances and family activities at Detroit’s midtown museums, churches, and venues; holiday shopping; food; horse-drawn carriage rides; and more. 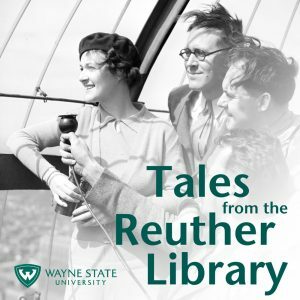 Courtney offers a sneak preview of the Reuther Library’s contributions to the 46th Noel Night on December 1, 2018: live labor- and holiday-themed music from our talented University Library System musicians; story time with children’s books from the ULS Special Collections department; Hanukkah games; festive archives-inspired crafts and photobooth opportunities; snacks and hot chocolate; and modern indoor plumbing. All for free!